I picked this up because I forgot my regular face sunscreen and now it's my HG product. Not greasy - It goes on very smoothly, absolutely no oily residue on my skin or my hands. It's a great base for makeup because it sinks right into your skin, so layering foundation or tinted moisturiser is flawless. Not irritating - No lingering scents and nothing that can irritate your under eye area. The bottle is a little pricey for the size but I just stock up during the sales. This is the facial sunscreen I want to use every day for the rest of my life! It is soft and creamy just like a regular moisturiser, so I can spread and blend it on my face and neck super quickly without any streaks or white cast. It actually is invisible! I love that it combines moisturiser and SPF in one, so I save a step in the morning (and save money). It is so gentle, it never stings my skin (even on those days when everything else does). It keeps my skin nicely moisturised all day without ever feeling tight or dry. At the same time, it does not get greasy or shiny during the day even on my T zone. It looks a little shiny when I first put it on, but it absorbs within 5 minutes. It works perfectly with primers (both silicone based and silicone free) and with liquid, powder or compact foundation. It can be hard to find, as most bricks and mortar chemists do not stock it. So you will need to look for it online. Don't confuse it with the other Invisible Zinc products, as they are all too thick and greasy for wearing under makeup (for me anyway). This is a great product and I really love the brand. I play a lot of sport in summer and it is very important for me to protect my naturally fair skin. I love the packaging and the feeling of the product one applied to skin, it goes on really smoothly with no sticky residue and can have makeup applied over the top also. I think its is best suited for use on the face as the skin on the facial area is thinner and more sensitive/exposed more regularly. Always apply on freshly cleansed skin where possible, and reapply when necessary if outdoors. Most skin types, and suitable for dryer/fairer complexions like myself. Highly recommend for people who are allergic to chemical sunscreens. In spring of 2017 I discovered that I was actually allergic to chemical sunscreens which was why my face would swell up all red and itchy every time it'd touch my face. Once I knew that, I began to do lots of research on what I could do and use to protect myself from the sun. Invisible Zinc is a physical sunscreen rather than chemical and it does an amazing job at protecting my skin from the sun. Just a word of warning, if your skin tone is on the tanner side, I suggest you get tinted version instead of the plain white one because it'll leave a bit of a white cast. The best face sunscreen I have ever used! I have pale and sensitive skin, so I find I get burnt easily. However I purchased the Invisible Zinc facial moisturiser a week ago and love it already. When you apply the product it is very easy to add to (primer, foundation and or concealer). My favourite things about the product are: the nice smell, how you only use a small quantity each time and it is a moisturiser, zinc and sunscreen all in one. Please try this, you will love it! 1. Only use a small amount of product, a little goes a long long way. 2. I found it worked better if you cleanse beforehand for a day / work look (when applied to clean skin). Anyone wanting a reliable sunscreen that can be work alone or under foundation. I love this product. Apart from its intended application as sun protection, it gives a great natural finish and works almost like a BB cream to smooth blemishes. Less is more - product will settle in to skin within 5M of application. Light coverage for days out and about in the sun. It's kind of weird to give a sunscreen 5 out of 5 stars hey? I really do love this product and find it deserving of such a great review. I use a lot of chemical exfoliants in my skin care routine so I was set on finding the ideal sunscreen for me. I wanted a physical sunscreen that wouldn't leave an obvious white cast nor dry my skin out. Invisible Zinc ESP Environmental Skin Protector 30+ is the one for me. I have not been let down. I purchased the 50ml bottle for $38. Not cheap but well worth it. It has a lotion like consistency and leaves the slightest white cast on my skin. However, I'm quite light skinned so it isn't noticeable on me. Perhaps those with darker skin-tones than me wouldn't like it as much. Additionally, it is easy to rub in and doesn't leave a greasy residue. Once it sinks in (takes a couple of minutes), I can't even feel it on my skin. It feels weightless and my skin feels moisturised too. I've got combination/dry skin and this leaves it feeling protected without that heavy feeling. It has not broken me out at all neither. Overall, this is the perfect physical zinc-based sunscreen for me. It makes me look forward to putting on sunscreen. It doesn't have that heavy sunscreen smell and doesn't leave an obvious white cast on my skin. It feels light and sinks in easily. I find it's easy to remove also. Yes, it's pricey but it delivers! I'm glad I've found a physical sunscreen that works for me. Highly recommend this sunscreen to those that don't want to use a chemical sunscreen, but can't stand the heavy feel of most physical sunscreens. This is a stand out sunscreen :). I've been using this first thing in the morning just to head off to the gym. - Afterwards I completely wash my face and apply serums, eye cream, moisturiser and full sunscreen. So it's perfect for that 1st couple of hours in the morning as it contains SPF and moisturiser which is all I'm after for that time. I have dry skin and I haven't found it hard to blend at all, but I usually apply it pretty fast and I'm not really looking for perfection. I really like the pump dispenser as it's so quick and easy to use and it ensures the product stays fresh. I love this face sunscreen! It is very effective as it contains physical sunscreen, which the sun does not break down. I wore this sunscreen every day when I was travelling around Europe in the summer. Italy was the true test as to its effectiveness, as it was over 30 degrees every day with the sun blazing. I did not get sunburnt on my face! The zinc in the product has also helped my acne-prone skin. The only con is that it leaves a white cast on your face and doesn't blend smoothly. This can make foundation application a little troublesome, but it's the price you pay for a superior face sunscreen product. I believe the moisturiser component makes it a little easier to apply. Another possible flaw is that the product gets stuck in the pump opening, which means that you waste a little product each time as it gets clogged up and dries. I will definitely repurchase when I run out. As there aren't as many physical sunscreen products as chemical, I will stick to Invisible Zinc. I found the level of sun protection was fantastic. It was quite thick to apply and did leave my face looking white, but that disappears after a while. While I wouldn't wear this everyday, due to the thick consistency, I would wear it if I was going to be spending a lot of time in the sun. Sunscreen works fine, with fault. so badly that i brought a backup. When you hear "physical sunscreen" you almost jump. Because unlike chemical physical will BLOCK. - This sunscreen is amazing for people with fair, pale skin. It has a slight white cast, that disappears but for people with pale skin give's a flawless matte finish. - Although people here are saying it's simple and easy to apply, this wasn't the case for me. It was hard to blend, once i put a dab on my face i found i had to blend REALLY quickly so it wouldn't leave white marks on my face. - Another con is it became patchy, i worked really hard to fix this sunscreen and make it work in different ways. No matter what i did, because it was so thick and hard to blend it was impossible to make the sunscreen blend on my face and left white patches and dots everywhere that ended up looking like dead, flaking skin hanging off my face. In the long run as amazing as this product sounds as amazing as the concept of it is. It didn't do a good job, the faults out weigh the good. 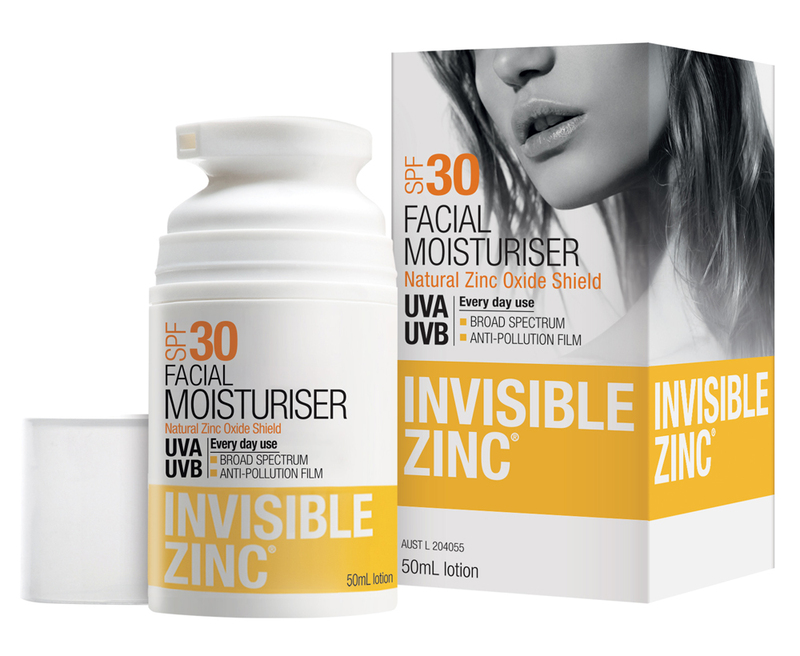 RESPONSE FROM INVISIBLE ZINC: Dear Rachelle, thanks so much for taking the time to review Invisible Zinc ESP SPF30+. We're sorry you have had a less than ideal experience with our product. We value your feedback and take all comments on board for further product development and improvement. If you have any further feedback feel free to email us at info@invisiblezinc.com.au. Best regards IZ. I use this on my face, neck and chest as well as hands. I find that it's easy to apply and sits well on the skin. It also feels lightweight. There is also no greasy feeling like with other sunscreens and it doesn't look shiny when applied. However it does have a sunscreen-like scent, in that it smells similar, but not quite. I also wish the bottle was bigger for the price! But it is so worth it for the SPF 30! I bought this when I was working outside and needed a heavy duty sunscreen. I have since rediscovered it and I have started using it under my makeup each day. I am shocked that this does not leave my skin greasy (since I have oily combination skin), and I barely notice that it is there. I am so happy that I have started adding this to my skincare, I am sure my skin will thank me in the future! My only issue is that it can mix strangely with my moisturiser and it can make it a little harder to blend in... but meh, its not a big deal. I wish I started using this earlier under my makeup each day! Pros: Provides very good protection for my extremely fair skin, leaves no white cast and is non-greasy. Cons: In my opinion this feels heavy on the skin and also remains quite sticky to the touch for quite a while. As I like to use this under my quite full coverage makeup each day, I really would prefer if it were more lightweight and left a more silky finish so I could skip a primer. I love this product it has everything in a sunscreen but more, this goes in my sons bag for school as its easy to use and its not bulky while giving him the protection he needs. What I found the consistency of the cream itself is spot on as its not as messy as some of the other lotions. I have use it on my skin and it gave my hands a body a great moisturise boost that is a bonus in itself. I find the consistency of this a bit too white and gluggy. I also find that it works better if I wear this under an SPF which isn't ideal. The best IZ product ever was the vitamin A serum...I wish they'd bring it back! I have been using this product for a few months and it protects against sunburn. It's moisturizing and contains antioxidants to keep skin soft and young. The only problem I found was that it's difficult to rub into the skin. It can 'glob' in parts on the face. Often I'm left with white streaks that I have to vigorously rub in or remove with a cloth. I have found this is a common problem in all of the IZ products that I have used. Nonetheless, I will continue to use the product. Make sure you thoroughly remove the product. Best facial sunscreen I've tired. Not greasy! I've been using this for a while and I love it. Its a great base for you makeup. Not greasy and is quickly absorbed. The airless pump makes foe easy use and the fact that air isnt getting in and out means it'll last for long. No drying out. Also pop some on the back of your hands to stop age stops. Hands will always give you away on the aging front! Usually I pump out the sunscreen onto the back of my hand and then use a foundation brush to apply it. Whatever is left on the back of my hand then gets rubbed in by putting the backs of both hands together and then giving them a rub around. I tried this after finding it on special, but must admit I was extremely wary. Ive tried to love the IZ tinted daywear (want to support Aussie products & like the whole physical sunscreen thing) but hated it - rubbed off on all my clothes & left my skin shinier than a disco ball, even after several layers of powder. The ESP is an entirely different product - no oily residue, no strange chemical smell and make-up glides over the top like a dream. Love the fact that it's 30+ too, as it's challenging to find high SPF products that don't leave my face looking & feeling like the bottom of a chip-shop fryer. I also love the pump dispenser, meaning the product is completely protected from exposure to air. I would highly recommend this product, and that's something I rarely do!! This is a staple in my beauty bag - especially for the Queensland sun. Not thick on my skin and no overpowering odour others have. Recommend! Discover our edit of the best beauty offers, promotions and events of the week.